Typically, the Blues started with sufficient possession and intent, but the intensity was not there. Though they dominated the first half, they had little to show for it but a Mateo Kovacic header that hit the bar via the hands of an impenetrable Artur Boruc. And it took just 90 seconds or so for the home side to punish the visitors in the second period, as Josh King rammed it home past a bereft Kepa Arrizabalaga for the opener following a David Brooks pass. But that was just the start of a horrendous night for the Blues, with Kepa forced to retrieve the ball from his net a further three times - through no fault of his own. Time and again King and Brooks bamboozled the Chelsea defence, and the pair combined again for the Cherries' second, with the 21-year-old the one to profit this time after a misplaced pass from David Luiz. King then nabbed a third after pouncing once more on Chelsea's ineptitude, before substitute Charlie Daniels got in on the act right at the last with an excellent header to complete the humiliation. It was a *cliche incoming* tale of two halves for the Cherries, though neither were less impressive. In the first, they displayed all their defensive chops, giving Chelsea's latest recruit Gonzalo Higuain no chance to show off his fine finishing skills. The second was counter attacking at it's finest, as they sprung on any and all of their opponent's mistakes, and making no mistakes themselves with the finish. In the end, it was a procession. Starting XI: Boruc (8); Clyne (7), Cook (8), Ake (8) Smith (8); Stanislas (8), Gosling (7), Surman (7) Fraser (7); Brooks (8); King (9*). STAR MAN - This was David Brooks' to lose before he was forced off with injury. The youngster caused all kinds of problems for that Chelsea defence, assisting the first and scoring the second. But you have to give it to Josh King. The Norwegian bettered Brooks' total by one goal, and his sensational running and cool finishing was the biggest difference between the two sides. WORST PLAYER - This is a difficult one, because every member of that Cherries outfit was impressive - it's pretty much impossible to single anyone out. Steve Cook was excellent at the back, but because he almost managed to injure himself with a volleyed clearance, he scoops the unwanted prize tonight. This was a condensing of all ​Chelsea's faults into one deeply depressing 90 minutes. We'd been lead to believe that all of the club's problems would be solved by a competent striker. The creation was there, they just needed someone to make the most of it. Clearly, this was merely the most pressing of a whole cohort of issues. As has too often been the case, the Blues possession was turgid. Even with a target up front, there was no point to it. The wide-men were woefully inaccurate, the central midfielders aimless and the defence sloppy. While perspective should be heeded - they have just qualified for a cup final - it will only provide more fuel for those heedless few banding for Maurizio Sarri to leave. Still, a terrible, terrible night for him. Starting XI: Kepa (6); Azpilicueta (4), Rudiger (3), Luiz (3), Emerson (4); Jorginho (4), Kante (4), Kovacic (4); Pedro (3), Higuain (6), Hazard (4). Substitutes: Willian (3), Giroud (3) Loftus-Cheek (7*). STAR MAN - If only because it was great to see him back in league action, and he wasn't tarred with the brush of the minutes prior, the award goes to ​Ruben Loftus-Cheek. He was also the only substitute to provide a semblance of impetus, and played with genuine intent from the off. Classy, classy player who deserved better. WORST PLAYER - As difficult as the one for Bournemouth, but for the opposite reasons. David Luiz, however, takes the mantle with his dreadful misplaced pass leading directly to a Bournemouth goal. We know he has an error or ten in him, and unfortunately for Chelsea - tonight was the night. After taking themselves out of the top four via goal difference with this monstrosity, Chelsea will seek to right these wrongs with a home clash against Huddersfield on Saturday. 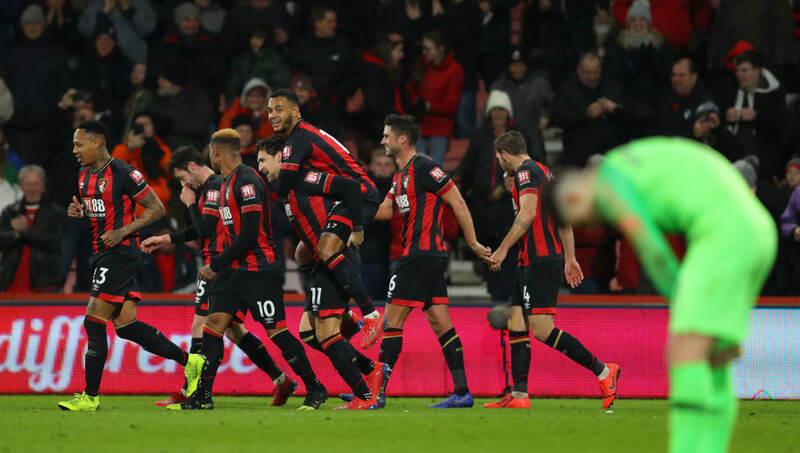 At the other end of the scale,​ Bournemouth will travel to league leaders Liverpool, though they'll have more than a spring in their step.